Phil Knight's gripping memoir, Shoe Dog, tells the rags-to-riches tale of how the multi-billion dollar international corporation Nike was built from the ground-up despite seemingly endless obstacles. 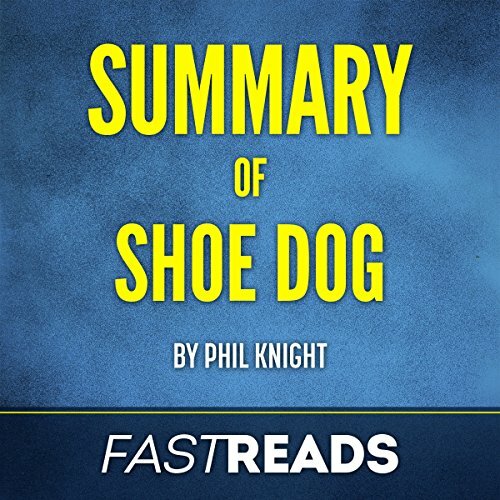 This FastReads Summary & Analysis offers supplementary material to Shoe Dog to help you distill the key takeaways, review the book's content, and further understand the writing style and overall themes from an editorial perspective. Whether you'd like to deepen your understanding, refresh your memory, or simply decide whether or not this book is for you, FastReads Summary & Analysis is here to help. Absorb everything you need to know in under 20 minutes! In this enthralling memoir, Shoe Dog, Nike co-founder and chairman Phil Knight shares the riveting journey of the company from its early days in his parents' servant quarters to its current status as one of the world’s most renowned brands. He narrates how, young and fresh from graduate school, he sold his car and set off to see the world. Along the way, he would stop by Japan and make his college idea of pervading the American market with Japanese running shoes work. This book captures every significant moment of Knight’s relentless journey; from selling shoes from his Valiant to heading a company that grossed $16 billion in 2006. Please Note: This is a summary, analysis and review of the book and not the original book. This analysis is meant as a supplement to, and not a replacement for, Shoe Dog.